Our vote is firmly with the latter – as there is no doubt that the Digital Workplace has changed the way workers work and collaborate with each other. More and more technologies now allow for collaborative work across offices, state lines, oceans – even flight paths. The Digital Workplace helps to aggregate these technologies into a common user experience and has spawned an entire marketplace of solutions, many (not all) built on top of the Microsoft technology stack to take advantage of existing corporate infrastructure. The Digital Workplace is made up of all the technologies people use to get work done in today’s modern workplace – with some in the cloud and some part of a company’s networked infrastructure. Companies of all sizes are embracing the adoption of virtual workspaces in lieu of, or in addition to the physical, and re-writing the distinction between a tangible location and any place where work actually gets done (double tall latté anyone?). This has enabled employees to communicate and collaborate with customers and employees in ways and in places beyond anything that was previously possible. 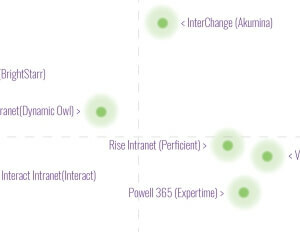 To put this all into perspective, we recently issued the Digital Workplace Market Landscape, a critical overview of the eight leading Intranet of the Future solution providers. In this all new report, we evaluate today’s top vendors across the core areas listed below and score each of them on a value perspective based on a capabilities to cost matrix. Read this report today to learn more about your options in this dynamic marketplace and what the best value solution for your business needs is.